This right here is the perfect Whole30 Instant Pot tomato soup (vegan) recipe. 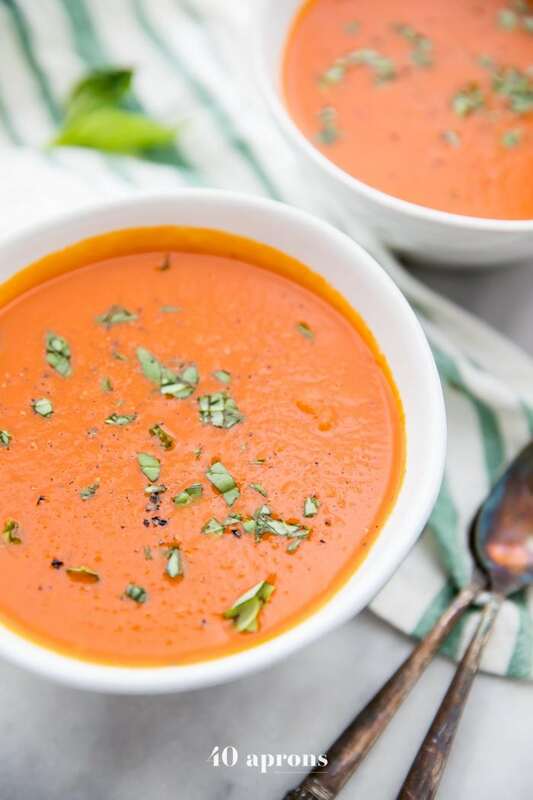 Creamy and rich but dairy-free and refined-sugar-free, this Whole30 Instant Pot tomato soup comes together easily and is the perfect nourishing and comforting soup for any Whole30, paleo, or vegan diet. No one would ever guess it’s Whole30 or vegan, either! Don’t have an Instant Pot yet? Click here to order one now – they’re life-changing! My earliest memories of tomato soup aren’t glamorous: impossibly thin bowls of the stuff, reconstituted from a can, served alongside grilled cheese, and in front of maybe Rugrats or Doug. I liked it but didn’t love it, and so I sort of generally wrote tomato soup off as an adult. 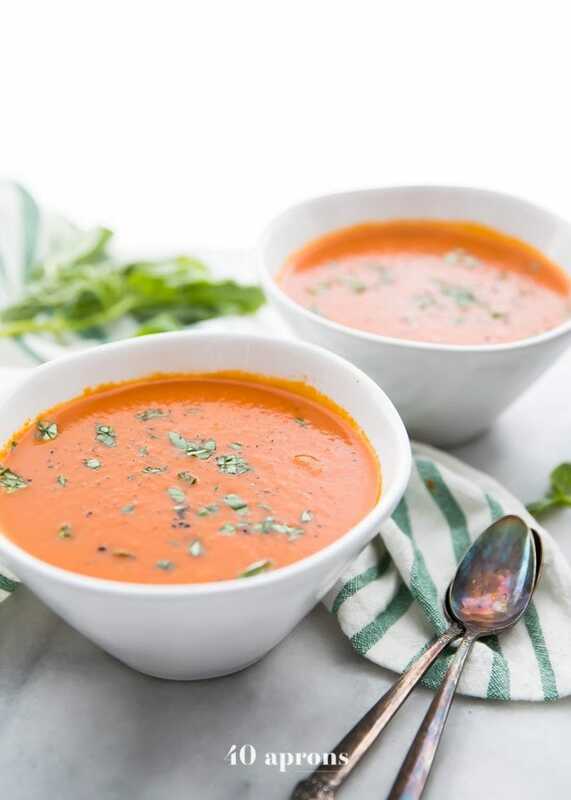 Don’t get me wrong; from time to time, a “tomato basil bisque” sounded good as hell to me, and I’d order it to beef up a salad or sandwich when were out to eat. I was missing it the whole time, though: the absolute beauty of a really good tomato soup. The perfect Whole30 Instant Pot tomato soup, even. Though I’d never in a million years have thought that a really perfect tomato soup could or should be Whole30, paleo, or vegan. Or made in the Instant Pot for that matter! It just sounded way too easy and way too healthy. But with the promise of cooler weather on the way (please please please), I started craving a tomato soup recipe that I could easily integrate into our modern eating, focused on whole, real foods and less on cream, cheese, and bread to go with it all. Straight up? 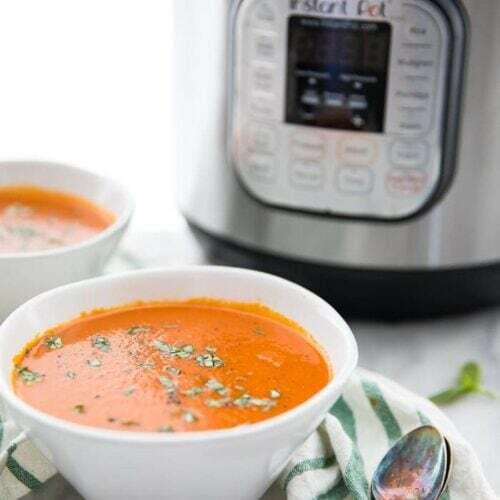 I don’t miss any of it, and especially not in this perfect Whole30 Instant Pot tomato soup (vegan!). 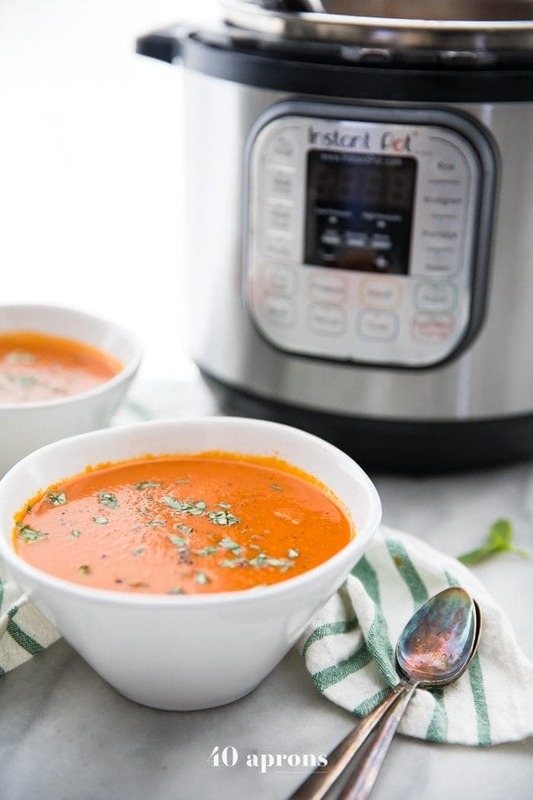 What makes this perfect Whole30 Instant Pot tomato soup, well… perfect? It’s creamy but still bright and vibrant, simple but not overly so, full of rich aromatics and herbs that perfectly support some top-notch canned tomatoes. I served it for the first time to my assistant and my husband during some weird holiday when he was home but I was still working. He put our son down for a nap and then slurped up a bowl of the soup. He admitted he wasn’t a big tomato soup person but this was really doing it for him. My assistant and I, on the other hand, are less subtle. Moaning and groaning and omg we need more is how we behave with a really, really great recipe, and there was so much of that going down on tomato soup day at 40 Aprons HQ. Trust us; it’s damn good. This perfect Whole30 Instant Pot tomato soup (vegan, too!) is fantastic alongside a salad with chicken or chicken salad on a Whole30. It’d be unbelievable with a vegan grilled cheese if that’s your thing! And I can speak from experience and say that it’s impossibly good with a mozzarella-Boursin grilled cheese that you justified because you were pregnant and you get to have grilled cheese dangit. Oh, and if you’re into Whole30 and paleo Instant Pot recipes, you should really check out my digital cookbook The Paleo Instant Pot. You might also like my Whole30 Instant Pot chicken tortilla-less soup! This right here is the perfect Whole30 Instant Pot tomato soup (vegan) recipe. 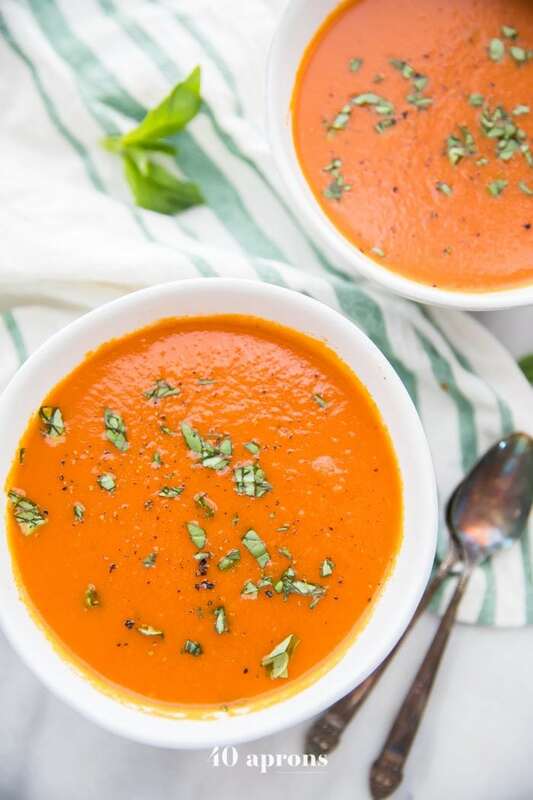 Creamy and rich but dairy-free and refined-sugar-free, this Whole30 Instant Pot tomato soup comes together easily and is the perfect nourishing and comforting soup for any Whole30, paleo, or vegan diet. No one would ever guess it's Whole30 or vegan, either! and garlic and sauté for 5-10 minutes or until onions and carrots are very soft. Add tomato paste and stir for a few minutes; tomato paste will begin to caramelize and brown a bit. Pour in the tomatoes with the juice, along with broth, thyme, bay leaf, and coconut aminos. Cook on Manual High Pressure for 15 minutes. Carefully Quick Release and remove lid. Add coconut milk or coconut cream to pot and lots of sea salt. Stir until totally combined. Working in batches, carefully purée soup in blender and return to pot. Serve with plenty of fresh basil leaves and fresh cracked black pepper. If you don't have an Instant Pot, you can make this soup on the stovetop. Follow the directions up until sealing the Instant Pot using a large pot on the stove. Add tomatoes, spices, and broth to the pot then bring to a simmer over medium-high heat. Reduce heat to low and cover. Simmer for 30 minutes. Uncover and proceed with recipe: stir in coconut milk, purée, and serve. The BEST and easiest tomato soup recipe! Thank you for one without red peppers. Loved it!!! I haven’t been happy with Tom soup at the grocery and this is my first homemade. I used almond milk instead of coconut and it is beyond good.Will never go back!! Such a rich flavor. Great for a winter night. This soup is wonderful and so easy to make. I love the flavor and tomato soup is one of my favorites. You have to give this a try you will not be sorry. YUM YUM YUM!